As its name implies, the Atlantic salmon has always been seen as an ocean dweller. But the Canadian fishing industry is on the verge of being able to grow this saltwater fish anywhere – including, hypothetically, in the prairie provinces. The Namgis closed containment facility on Vancouver Island is the first salmon farm in North America to grow Atlantic salmon on a commercial scale in a completely land-based aquaculture system. “It’s no longer possible to say that recirculation aquaculture systems … are not possible for Atlantic salmon, because we’re living proof that is [not] the case,” says Jackie Hildering, community liaison for the Namgis closed-containment project. The Canadian aquaculture industry has been around for a little over 30 years. It generates more than $2 billion annually and employs nearly 15,000 people from coastal and rural communities, says Ruth Salmon, executive director of the Canadian Aquaculture Industry Alliance. Traditionally, farmed Atlantic salmon are grown from an egg to a certain size in hatcheries on land. Then they&apos;re transferred to a floating net-pen just offshore on the east or west coast of Canada. Most Canadian net-pen fish farms are “certified by a third party to global [aquaculture] standards, or are well on their way to becoming certified,” says Salmon. Even with certified farming practices, disease and parasite outbreaks are fairly common in net-pen aquaculture. One of the issues for the ocean-based industry is that other than the walls of the cage that are made with netting, there is no barrier between farmed and wild fish. When an infection sets in, it is often treated with antibiotics or pesticides and not reported to the consumer. ​With concern growing about potential disease outbreak in fish and negative environmental impacts of net-pen methods, the Namgis First Nation sought to bring salmon farming inland where everything flowing in and out of the facility can be controlled, says Hildering. The Namgis project aims to add a hatchery and a manure collection system, for example. The fish manure is very nutrient-rich and can be used to grow crops, explained Hildering. The infrastructure, water and electricity costs are generally thought to be too high to make fish farming on land a financially viable possibility. But net-pen fish farmers need to pay for antibiotics or vaccines to ward off illness and disease, or to apply pesticides to remove sea lice from the gills of the fish, explained Steve Summerfelt, director of aquaculture systems research for the conservation fund’s freshwater institute and technical advisor to the Namgis project. These health risks and treatment costs could be eliminated before they begin if the tanks and the water are properly maintained. The overall cost of land-based fish farming will likely be higher than that of a net-pen system. But money can be saved on land because fewer food pellets are wasted and “we have better survival because we keep the diseases out," said Summerfelt. These savings bring the cost of the two systems closer together, he says. “We were told we couldn’t raise the salmon and get good growth or good survival in full freshwater, and we aren’t seeing that,” says Summerfelt. ​The Namgis closed-containment project had a few hiccups with delivery times for some of the equipment, but Hildering says, “we’re applying the technology, and it’s working." 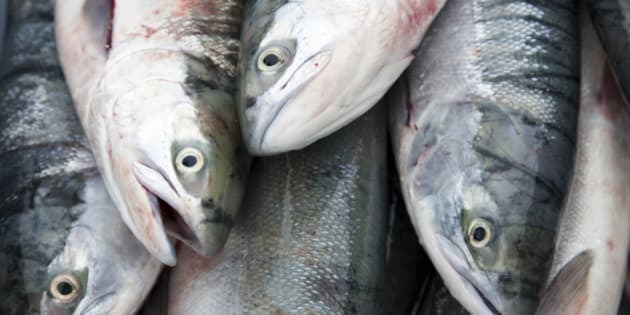 The first cohort of salmon entered the system on March 18, 2013, and “the first premium fish [three to five kilograms each] will be harvested in March, a year after entry,” says Hildering. Market projections suggest that there may ultimately be as much as a 30 per cent mark up in the price of land-reared salmon over other Atlantic salmon already available in the supermarkets. But a significant portion of her organization’s fish are already pre-sold, says Hildering, showing that people are willing to pay more for a sustainable, antibiotic and pesticide-free product. According to Summerfelt, land-based aquaculture systems can be located anywhere, even in the prairies. Their location can help minimize the cost of transporting fish to the market, or they can be located where there’s less expensive power. The future of fish farming will support both land-based and net-pen style farming because the demand for quality seafood is always increasing, Salmon predicts. “It’s unfortunate if we got into a net-pen-versus-land conversation, when in fact really we need to be producing more sustainably, responsibly produced seafood,” says Salmon.